Chaim Topol (Hebrew: חיים טופול‎‎; born September 9, 1935), mononomously known as Topol, is an Israeli theatrical and film performer, singer, actor, comedian, voice artist, writer and producer. He is best known for his role as Tevye the dairyman in the production of Fiddler on the Roof on both stage and film. He has been nominated for an Academy Award and a Tony Award, and has won two Golden Globe Awards. Topol was born in Tel Aviv in 1935 in what was then British mandated Palestine, to Rel (née Goldman) and Jacob Topol. He first practiced acting in amateur theatrical plays staged by the Israeli Army. 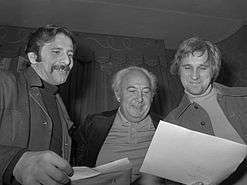 Subsequently he established his own theatre troupe in Tel Aviv, and in 1961 he significantly contributed to the foundation of the Haifa Municipal Theatre. Among Topol's earliest film appearances was the lead role in the 1964 film Sallah Shabati by Ephraim Kishon—a play, later adapted for film, depicting the hardships of a Mizrahi Jewish immigrant family in Israel of the early 1960s. The film was nominated for the Academy Award for Best Foreign Language Film and earned the actor the Golden Globe Award for New Star of the Year – Actor. In 1966, Topol made his first English-language screen appearance as Abou Ibn Kaqden in the big-budget Mickey Marcus biopic Cast a Giant Shadow. He came to greatest prominence in the role of Tevye the milkman in the long-running musical show Fiddler on the Roof, at Her Majesty's Theatre. After a major success on the West End stage (which began on 16 February 1967 and ran for 2,030 performances), he later starred in the 1971 film version. In 1972, Topol won a Golden Globe Award and was nominated for a Best Actor Oscar for his performance in the film. He was on active service with the Israeli Army at the time, but was granted permission to attend the awards ceremonies. In 1976, Topol originated the leading role of the baker, Amiable, in the new musical The Baker's Wife, but was fired after eight months by producer David Merrick. In her autobiography, Patti LuPone: A Memoir, his co-star in the production relayed that Topol behaved unprofessionally in front of paying audiences, sometimes speaking gibberish instead of his lines, and other times responding to the director's instructions by grossly overacting on purpose. Her account was echoed by the show's composer, Stephen Schwartz, in the book Defying Gravity: The Creative Career of Stephen Schwartz, From Godspell to Wicked, in which he claimed that Topol's behavior greatly disturbed the cast and directors and resulted in the production not reaching Broadway as planned. Some of Topol's other notable film appearances were the title role in Galileo (1975), directed by Joseph Losey, Dr. Hans Zarkov in Flash Gordon (1980), and as Milos Columbo in the James Bond movie For Your Eyes Only (1981). In 1983, he reprised the role of Tevye in a London revival of Fiddler on the Roof. In the late 1980s, he played the role in a touring United States production. He was by then the approximate age of the character. Also, the actress playing his wife, Golde, in that production—Rosalind Harris—had played his eldest daughter, Tzeitel, in the film. In 1990, he again played the part in a Broadway revival of Fiddler, and was nominated in 1991 for a Tony Award for Best Performance by a Leading Actor in a Musical, losing to Jonathan Pryce. He played the part again in a 1994 London revival, which became a touring production. He has since played the part in various productions including stages in Europe, Australia and Japan. His most recent film roles were in Left Luggage (1998) in the role of Mr. Apfelschnitt, and Time Elevator (1998) as Shalem. Topol went to Australia in 2005, playing Tevye in Fiddler on the Roof at the Capitol Theatre in Sydney in November 2005, then returned in April 2006 to the Lyric Theatre in Brisbane and in June 2006 to Her Majesty's Theatre in Melbourne. In April 2007, he played the role in Wellington, New Zealand. In September 2008, Topol played the part of Honore in Gigi at the Open Air Theatre in Regent's Park, London. His autobiography, Chaim Topol on Topol (aka Topol by Topol), was published in London (September 1981) and Israel (1983). Topol is also an illustrator, responsible for drawings in several books, including A Treasury of Jewish Humour. Topol serves as chairman of the board of Jordan River Village. ↑ "Topol Film Reference biography". Filmreference.com. Retrieved September 29, 2010. ↑ Fiddler On The Roof (The Guide to Musical Theatre). Retrieved December 29, 2007. ↑ Topol's Biography at Omanoot Archived June 2, 2011, at the Wayback Machine. ↑ "For Your Eyes Only". The New York Times. ↑ "Chaim Topol Male Performer". AusStage. June 10, 2006. Retrieved May 25, 2015. ↑ Propst, Andy (November 11, 2009). "Harvey Fierstein Replaces Topol in Fiddler on the Roof Tour: Theater News on TheaterMania.com – 11/11/2009". Theatermania.com. Retrieved September 29, 2010. ↑ "Israeli Board of Directors". Jordan River Village.